Reserve your room at Fiesta Henderson today with one of these exclusive promotions. 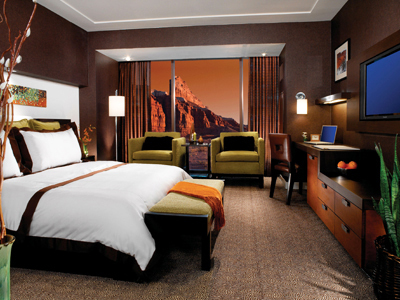 Book in advance and receive up to 25% off rates. Special packages for California, Arizona and Utah residents. More special packages including golf, suites, the spa & more! Red Rock is far more than a hotel and casino, it's a combination of sophisticated desert-inspired architecture and the Las Vegas party vibe. One of the most famous off strip destinations! Make your reservation today! At the base of Red Rock Canyon, 11 miles from the Strip, sits Red Rock Casino, an upscale resort and spa experience. Offering a lavish resort adventure with full spa, pool complex, amphitheater, bowling and movies, this is not a typical Las Vegas hotel! Both an adult and family friendly environment in a boutique-style design reflecting the natural beauty of the area. 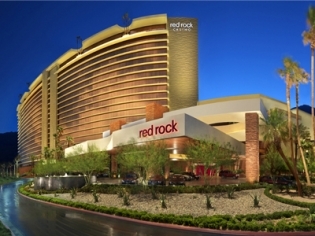 Red Rock Casino and Resort is truly an off-Strip destination worth the ride. Sitting at the base of Red Rock canyon, the hotel offers a view of the lights of the Strip or the natural beauty of the red rock formations. The “Backyard” is a 3 acre pool and lounge area with cabanas and even a gaming area. The traditional Spa has a relaxing vibe and serene atmosphere with holistic treatments. For those wanting a bit of excitement with their relaxation, the “Adventure Zone” offers kayaking, hiking, rock climbing, canoeing and horseback riding. Family-friendly activities abound with the 16 screen theater, 72 lane bowling alley and Kids Quest activity center. Nightlife can start at one of the dozen restaurants on the property. T-Bones Chophouse for steaks, Masso Osteria for Italian, Hearthstone for American fare or the Feast Buffet are just a few of your options. To heat up the night, start at Lucky Bar where everyone is a winner then move onto the Onyx bar to chill or to the Rocks Lounge to enjoy the pulsating sounds. Make plans to attend a concert at the Sandbar. 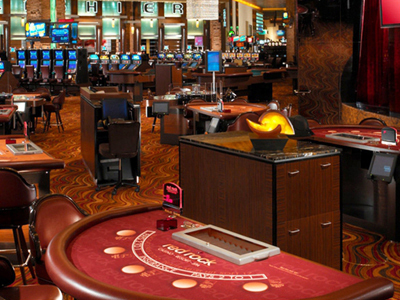 You may be off the Strip but you are never far from the action at the Red Rock Casino with the 24 hour Poker Room, two high-limit areas and state of the art slots and gaming tables. 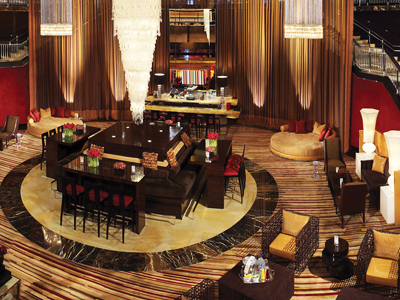 At Red Rock you get everything Las Vegas has to offer, plus a little bit more sophistication and variety! Spa/Salon: The Spa at Red Rock is a tranquil, luxurious space which features private treatment suites that seem to float on the water. Massage, wraps and peels are just a few of the offered treatments. A full service salon also pampers you with manicures, facials, hair and beauty artistry. A unique feature of Red Rock is the concept of the Adventure Spa which schedules outdoor adventures such as horseback riding, rafting, kayaking, biking, hiking and rock climbing. Pool: A three acre complex with 19 private cabanas, bars and cafes and an adult-only Cabana Club. Crawling, climbing and fun all in one destination; at Kids Quest no child will be unsupervised or bored! 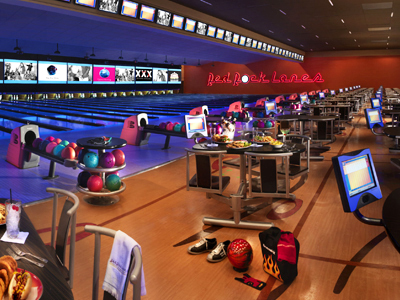 Bowl your next perfect game on one of the Red Rock Bowling Center’s 72 state-of-the-art lanes. This luxury bowling facility has a lounge, snack bar, pro-shop, lane service and much more to offer. Catch the latest movie in a plush theater. With 16 screen, and IMAX movie theaters, Regal Cinemas has plenty of movies and times from which to choose. The centerpiece of the Red Rock Resort, the Sandbar Pool is a multi-acre destination with a large main pool and nine wading pools. 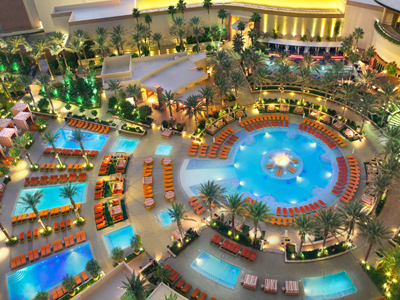 The island fountain will cool you down and the poolside gaming tables will heat you up! There are 19 private cabanas available for rental as well as CA-beds. Specialty drinks, cocktails and refreshing bites are also available poolside. We all really liked Red Rock. The rooms were nice and spacious. Outside the Red Rock is just beautiful. It is more on the quiet side and it’s off the strip. Our family liked the privacy. I’m glad I chose something further from the strip this time. I rented a car, and came and went to the strip as I liked. I was even able to go hiking at Red Rock since it was so close. I loved my room, and how clean and comfortable it was. The spa was the most relaxing experience, and the pool was super cool and luxurious. Definitely loved eating at Lucille’s, best BBQ hands down, and they have a food court as well as a Yard House attached. There’s even a glow in the dark bowling alley and a movie theater! Makes you never want to leave. Cleanest and best kept hotel around! Great buffet and reasonably priced. Included shuttle service to and from airport and the Strip. Great hotel!! This hotel was both wonderful and gorgeous! We were very happy with our Experience here! This resort was really such a comfortable place to stay! The decor in our room was very warm and inviting! It really was a tremendous room! I have been to the Red Rocks 3x and I’m planning another trip in a few weeks. Can’t say enough great things about the Red Rocks. Their shuttle will pick you up from the airport and and will take you back. Their rooms, pool, casino and food is all first rate and the view is breathtaking. They have shuttles that run all day to the strip and back should you want to check it out. It is worth seeing, however its nice to know that you can take the shuttle back to your getaway and away from all the clatter and cheesiness of the strip. The Red Rocks is about 15 minutes from the strip. Do yourself a favor and stay at the Red Rocks. It’s the best of both worlds and you won’t be disappointed. I did not like to pay a non announced daily quota in the room daily rate. We got a great deal to stay here. Our check in was easy. Room was ready for us. The hotel was so pretty. Loved the pool. Great places to eat. Spacious room and comfy beds!! Had fun in the casino too. Just returned from the Red Rock. We had a delightful time. The crowd was not the 21 party crowd. (35-45) which suited us just fine. The RR is a beautiful resort. Our room was kept very clean. There was plenty of room for the 2 of us. Our bathroom was grand also. The staff was always pleasant to deal with. We did eat at the restaurants, no complaints, friendly staff as well.